These sturdy paper cutters are safer, more accurate, and more efficient than any we've seen. 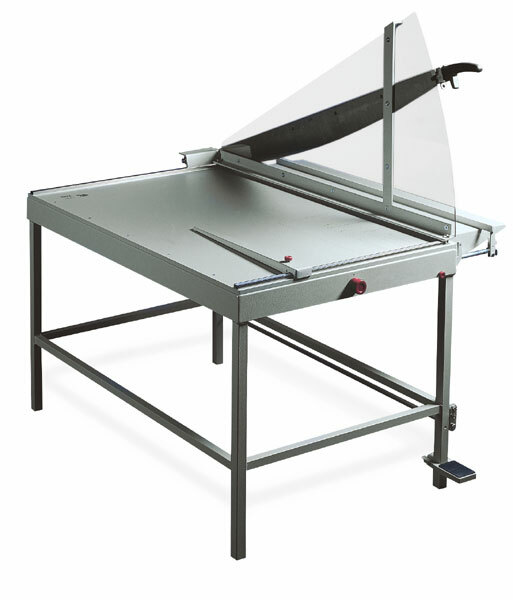 All models of the Kutrimmer will cut paper, cardboard, fibreboard, foils, vinyls, rubber, fabrics, leather, linoleum, felt, thin plywood, thin soft metal, and various specialty materials. Table models cut up to 20 sheets at one time, Floor models cut up to 40 sheets at once. Kutrimmer cutters are solidly built using heavy-gauge welded steel construction, with a Plexiglas® blade shield. An adjustable alignment bar sets the length or width of the cut. Floor standing models have a foot-operated clamp, and a lock and key to prevent unauthorized use. They also feature a fold-down extension table that provides support for large cutting jobs. To view a PDF of the Operating Instructions for the Kutrimmer Trimming Board, please click here. ™ Kutrimmer is a trademark.